The key to great stuffing is not the sausage. I believe it is using “real” bread crumbs. If your breadcrumbs are too small or not dry enough, you end up with a mushy, doughy, stuffing that is strange and inedible (or almost inedible). I always buy bread and toast it to use in stuffing (see note at bottom of recipe). 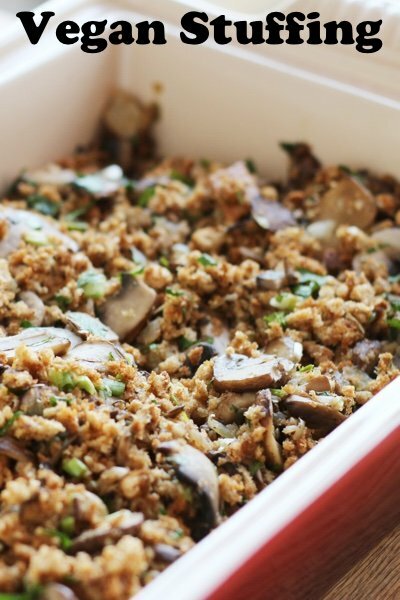 You don’t need sausage for delicious stuffing. 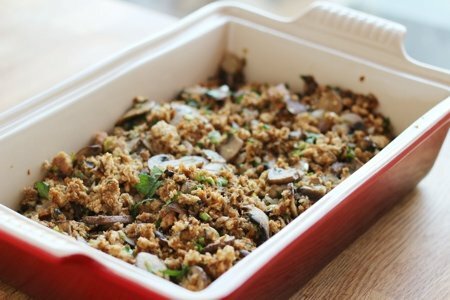 This stuffing is vegan and tastes fantastic! I use mushrooms to lend that “meaty” flavor and onions, garlic, sage, scallions and parsley to hit all the herbal tastes. The mushrooms release their juices when they are sautéed so you don’t need to add any stock. Finally, I use whole wheat bread for the breadcrumbs to add earthiness. Because I am lazy, I buy pre-packaged sliced and washed mushrooms. This cuts out a laborious step and we all need less labor on Thanksgiving. Preheat oven to 325 F. Spray a casserole (9x13x2) with non-stick spray. Heat olive oil in a large saucepan. Saute the onion, garlic, and mushrooms until mushrooms and onions soften and release their juices (about 10 minutes). Remove from heat and mix in bread crumbs, sage, scallions, and parsley. Taste for salt and pepper and put stuffing in casserole dish. At this point, you can bake the stuffing or store it in the refrigerator for 2 days with a tightly sealed lid. Bake for 45 minutes or until heated through and lightly browned on top. Note: To make 6 cups fresh bread crumbs, pulse about 6 slices bread in blender or food processor. Put crumbs on a rimmed baking sheet and bake at 400F until toasted (about five minutes). Thanks for posting this Snack Girl. I just found out I am diabetic and having a hard time figuring out what I can and cannot eat. I love stuffing so this came just at the right time..
Barb, that is such a great idea!! I would have never thought about making extra stuffing and freezing it. Love the mushroom idea. I use them in turkey meatloaf too to keep it moist. Add chopped celery, apples (or cranberries), walnuts and/sliced almonds makes it even tastier and still in line w/diabetic requirements and adds a crunch factor. Can't believe I've never done this without butter! Thank you, Lisa for this lovely recipe. The olive oil really appeals to me. Happy Thanksgiving! @karen - the Ninja would be perfect. Pulse the bread to the size that you like. I like bite sized pieces. Thanks for your question!